Lithium Ion is becoming the technology choice for HEV, PHEV, as well as many stationary applications. With such large battery packs it is important to understand how the individual cells and packs will behave in a variety of scenarios. 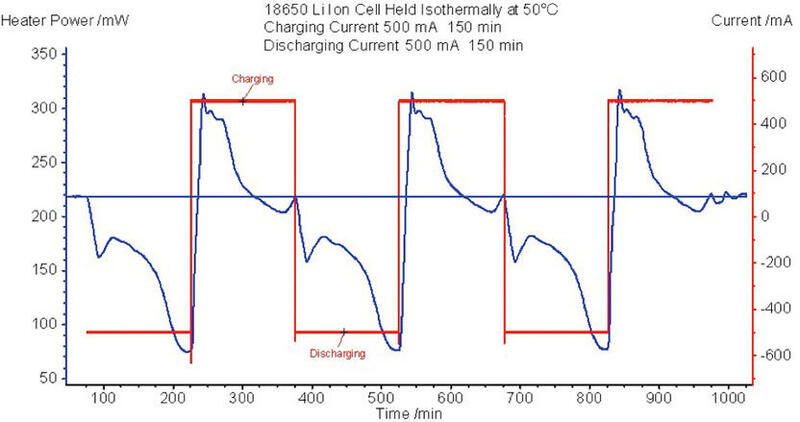 One of the main drawbacks for Lithium Ion cell technology is the potential for thermal runaway. Heat management of these large battery packs requires data on the heat output of the individual cells during normal operation. This information can be readily obtained using isothermal calorimetry. Lithium ion batteries are used across many consumer and industrial markets were portable and/or back-up power is required. The performance of these cells, high power density and no memory effects has enabled many technologies in ways that would not have been possible otherwise. More recently, Lithium ion batteries are now the foundation of electric vehicles. Lithium ion technology has many advantages but one significant drawback is the potential for thermal runaway. Also given some of the newer applications and their associated demand on the technology, it is not clear how well these cells and packs will perform over years of use in different environmental conditions and how this may impact safety. 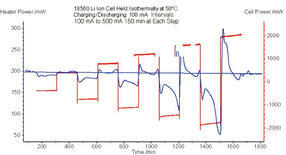 Thermal Analysis and Calorimetry has been used to study battery materials and full cells. This information is useful for understanding the chemistry and to design inherently safer batteries. 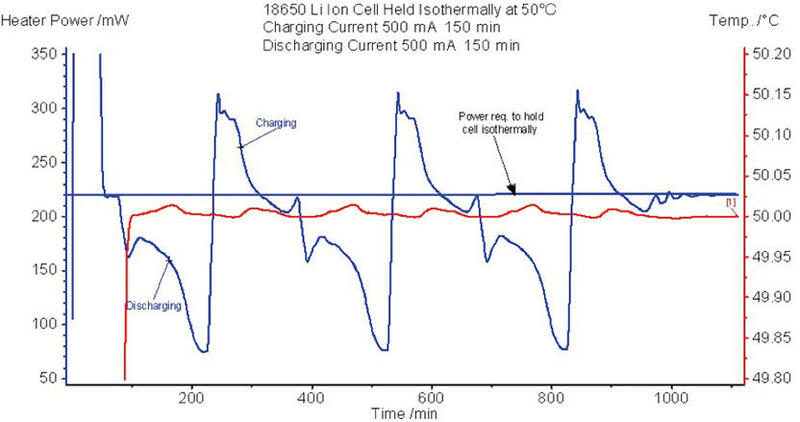 Calorimetry, in particular isothermal Calorimetry, in conjunction with charging/discharging in normal and exaggerated conditions is critical for thermal management studies and to estimate long term effects. This white paper will detail the application of isothermal Calorimetry. 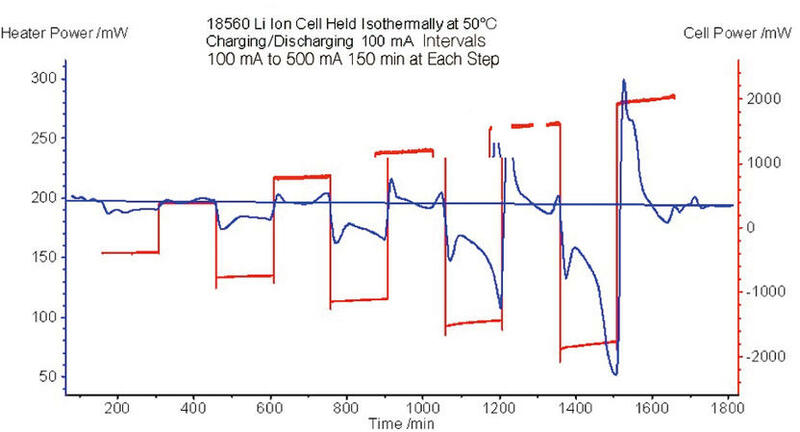 The Calorimetry testing discussed in this paper was conducted using the NETZSCH ARC® 254-system (Figure 1) equipped with the battery cycler interface kit and the 18650 VariPhi™ sensor. The ARC® 254 is an accelerating rate calorimeter designed specifically for adiabatic operation. However by incorporating the VariPhiTM sensor the user is able to run true isothermal Calorimetry experiments. The difference between isothermal calorimetry and adiabatic calorimetry is significant. Adiabatic calorimeters, like the ARC, are often used to study thermal safety because they can test samples in the “worst case”. Any self-heating by the sample causes the sample temperature to increase which then leads to more heat production and eventually to thermal runaway. This is not normal operation of a battery pack and does not provide directly-or even indirectly-the heat information required for thermal management. Isothermal calorimety holds the sample at a defined temperature and measures the heat required to maintain the sample at this fixed temperature. No adiabatic calorimeter can hold a battery or any system which is not uniform in temperature adiabatically. 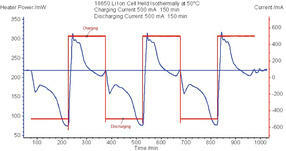 Adiabatic Calorimetry also suffers from another drawback when investigating battery cycling the ARC can only measure exotherms accurately and not endotherms. Compare this to isothermal Calorimetry which can measure both endotherms and exotherms while keeping the sample temperature constant. 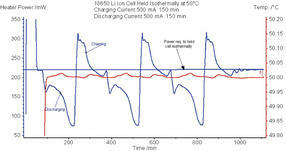 This type of Calorimetry most closely resembles the normal operating conditions of cells and the Calorimetry data obtained can be used directly for thermal management. Using the patented VariPhiTM technology one can run the ARC to get isothermal and heat capacity data. Furthermore isothermal calorimeters are generally not designed to handle the potential risk of thermal runaway and explosion but using the VariPhi and the ARC together one has the advantage of running the isothermal test in a robust ARC calorimeter. This is a unique feature of NETZSCH ARC line. The VariPhiTM technology has been introduced over 5 years ago and is described in several publications. The development of the 18650 3D sensor assembly is recent and works with existing VariPhiTM systems. 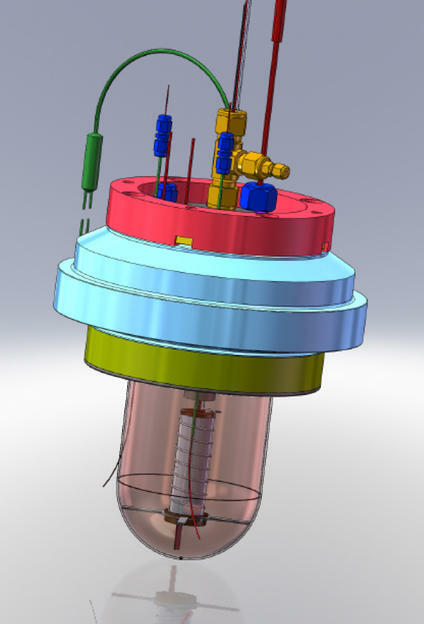 A photo of the sensor is shown in Figure 2 and the relationship of the 18650 cell 3D sensor within the calorimeter is provided in Figure 3. The sensor consists of a silver body. 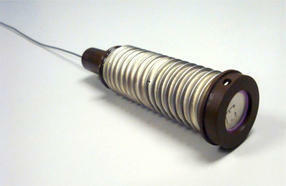 The inner diameter of the cylindrical sensor is specifically designed to provide a good fit with a standard 18650 cell. Best measurement data is achieved when the battery is in good thermal contact with the metal surfaces. No matter where the heat is generated in the cell it is quickly integrated by the metal housing. Any changes in the temperature of the housing are quickly detected by a thermocouple located in the center of mass. A heater wrapped around the outside of the sensor is used to keep the cylinder at a constant temperature. Careful measurement of the temperature and the heating energy result in good isothermal temperature control. Connections to the cycler are also held inside the isothermal zone. The electronics to charge and discharge the cell is available from third parties. In some cases the software of the cycler can communicate directly with the ARC software. When this is not possible an interface kit is available which provides the capability to independently read the voltage and current into the ARC software. This is done by using two high precision 6 1/2 digit Agilent multimeters. Specially designed shunt resistors are used to calculate voltage and can easily be interchanged to adapt to varying current ranges. Also included in the interface kit is a special tube heater assembly to facilitate connections of wiring running in and out of the calorimeter. The tube heater also heats the wires going in and out of the calorimeter to reduce any heat exchange that might otherwise be present. A series of test were conducted using a commercially available 18650 cell to gauge the performance of the system. An example result showing the temperature and heater power vs. time is shown in Figure 4. 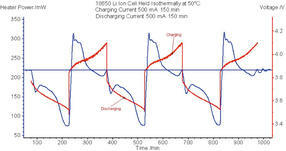 In this test the cell was held constant at 50°C while the cell was being charged and discharged at 500 mA. It is easy to see that the temperature of the system was well maintained at 50°C with only a slight diversion of 0.02°C during times when the instrument was switching between charging and discharging modes. The battery was charged/discharged three times and then the system was held constant, without cycling, to establish a baseline. This baseline is a function of instrument condition and the self-discharge rate of the cell. Using this baseline one can calculate the overall heat gained or lost during cycling simply by integrating the peaks. It is evident that discharging is exothermic and charging is endothermic. Also clear is that the endotherms for any given cycle is smaller than the exotherm. The reason for this is more clearly illustrated in test sequence summarized in Figure 7. In this test series the current for charging and discharging was increased after each cycle. In the first few cycles the power is more or less a step pattern. However with increasing current we see that the power curve becomes distorted. This occurs because the cycler is trying to charge the battery beyond its capacity. This can be associated with the Li-ion “pressure” increasing due to mass transfer limitations at the interfaces. The sample power is just the inverse of the heater power. The heater power is plotted with current as a function of time in Figure 5. The heater power is directly proportional to the current as can be expected. When the current is decreasing, the rate of the endothermic reaction also decreases which leads to a decrease in the power needed to keep the battery at isothermal temperatures. 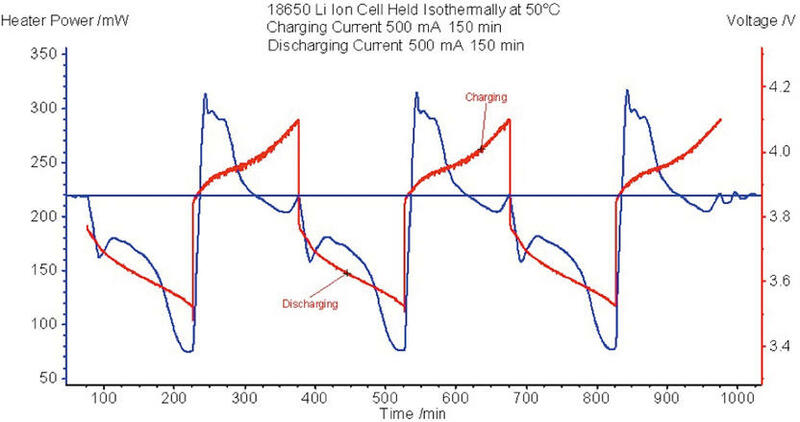 It can be seen in Figure 6 that the increase in voltage by the battery cycler as adding charge to the cell becomes increasingly more difficult. Cell heat is not correlated as directly as it is with the current and this is especially clear during the discharge cycle where voltage drops but the cell heat remains relatively constant. Battery cycling inside a calorimeter can provide insight into the underlying phenomena occurring in the cell. Furthermore the necessary data to design thermal management systems for battery packs can be determined at normal and exaggerated operating conditions. 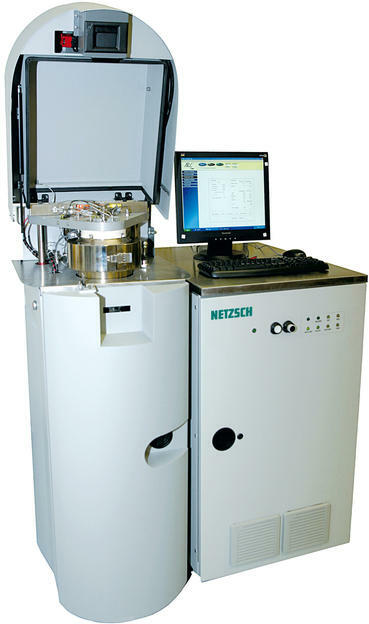 Because this unique isothermal system is built into a robust calorimeter it is quite possible to perform isothermal cycling tests at temperatures close to or even beyond the stated operating temperature to get a better understanding how the cell will behave in a variety of conditions. For large cells this could conceivably lead to power output which outpaces the cooling capability of the calorimeter. In such cases thermal runaway and explosion are likely to occur so testing must always be done at a level which is meaningful and also safe. Hence working on smaller cells in conjunction with thermal modeling software is often an effective compromise. To do so would require the isothermal conditions and controls as described in this paper. Such pseudo-methods such as isothermal aging and other adiabatic methods cannot reliably provide such data. These types of calorimeters are best suited for looking at thermal runaway of cells within packs for the design of safety features and to minimize the risks of internal shorting from leading to thermal runaway. The unique combination of adiabatic and isothermal testing in a single unit provides the user with the necessary flexibility and safety to run a comprehensive testing program. Mr. Peter Ralbovsky has been working with calorimetry and batteries for over a decade. In 2009 he started working at NETZSCH as an Application Specialist.